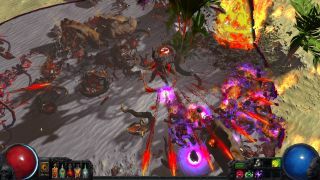 You won't be surprised to learn that free-to-play action RPG Path of Exile is getting another enormous update, this one adding inter-dimensional portals that transport you to a Hellish world known as the Breach. If I'm reading this correctly, they're basically the Oblivion portals from Oblivion, only with hopefully fewer scamps. (Man, scamps were annoying.) Anyhoo, developer Grinding Gear Games has detailed the Breach update here, ahead of its imminent release on December 2. Breach lobs in a bunch of Breach Challenge Leagues, new 'orrible bosses named Breachlords, magical whatsits called Breachstones, and a big pile of shiny loot for you to find inside monster intestines. Revamped cloth and fog physics are also to be expected, the former being shown off with the new cloak accessory items. "Tears in the fabric of reality have formed throughout Wraeclast" Grinding Gear explains. "Engage them to expose an alternate realm and reveal those who dwell there. Slay monsters inside the Breach to keep it open long enough to reap your bounty."